As I mentioned in several posts before, Hubs and I have been working on the home office. For the past few weeks, we have been working on a shelving and storage unit for the office, using items we found on our family farm in South Georgia. Well we finally finished the unit late last night. I couldn't be happier with the way that it turned out. Hubs thought I was crazy when I begged to bring home these old doors. I knew I wanted to do something special with them. A storage unit/set of cabinets was immediately what came to mind when we were loading them up in the back of the truck to carry back home to Atlanta. Here is what they looked like before. 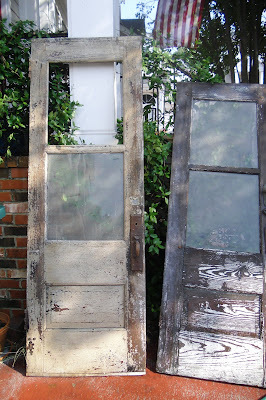 You can read the full post on "antiquing the antique doors" HERE. Hubs built frames, hung the doors, cladded the cabinets in some beautiful barnwood (also from the farm), added some beadboard to the inside as well as some shelving. I decided to paint the inside of the cabinet the same color red as we did the chandelier for the office. Remember my sassy chandy? 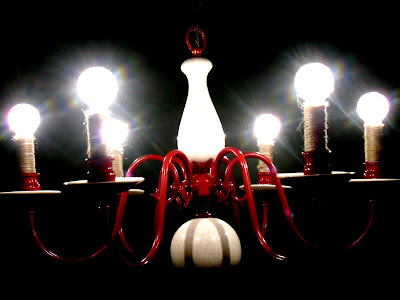 You can read more about the transformation of the chandy HERE. 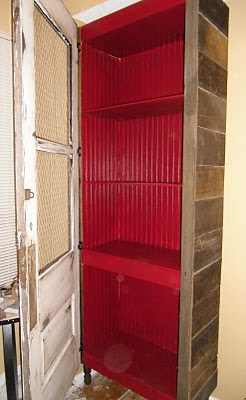 Here is the inside of the cabinet - with the red beadboard and shelves. LOTS OF STORAGE... HOORAY! 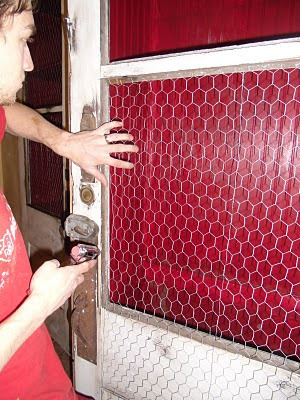 We added some "chicken wire" where the glass panes once were. This kind of gave the cabinets a Pie Safe look - which I am totally digging. We decided to do two cabinets and have barnwood shelving between them. We also decided to leave on all of the original hardware. I love all of the locks (I am pretty sure the original owners were paranoid about robbers and break-ins... so many locks!) I am so happy with the way it all turned out. I also have to say that I constantly amazed at the Hubs' talents. He can pretty much build almost anything I ask him to... even seven foot tall cabinets built out of old doors. Gotta love that! These pics really don't do them justice - but see below for the almost final product! We still have to add some trim to the top of each cabinet. I will try and take some better pics this weekend with some natural light. These pics were taken while around 11:00 last night in some pretty bad angles, not to mention I was getting pretty tired. 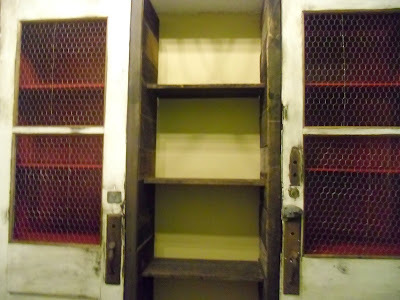 Now I know this storage unit isn't for everyone... it's very, very rustic - but it is very special to us because it uses items that come from my family farm! Let me know what you think! ALSO - I am SO excited that Beth over at The Patchwork Chronicles featured me today for her Inspired Spotlight! I posted on the office cabinets and even did a FULL tutorial of how to build some yourself! Please go and check it out. Her blog ROCKS! Thanks again, Beth! The weekend is almost upon us friends! Hope everyone is staying warm and safe. I will be working a little more on the office this weekend so stay tuned! Talk soon, Friends! I LOVE the way they turned out. I am always jealous of people that can see something old and refurbish it into something new. I only get ideas from other people. I don't have the eye for transforming things into amazing things! Thanks for guest posting for me too! I really appreciate it!! OK... now THAT is EXACTLY what i want to do in our living room for some storage! Have you been to Miller Union Restaurant in Midtown? They have cabinets with the chicken wire... and now I must have them. Beautiful Brandi!!! and great job K! That is magazine worthy - you should submit it somewhere! Beautiful. I love them, Brandi! I can't wait to have my own place...your blog and projects will definitely be a source of inspiration! Great vision. You are so talented. Looks amazing! Can't wait to see them in person :) I bet your soo happy to have them done!! Just fabulous! 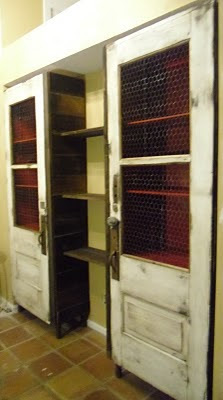 I love how it turned out, this was such a creative way to use an old pair of doors. Thisngs of sentimental value adds the most to a home, doesn't it?